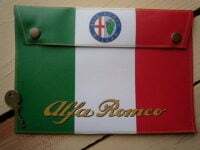 A pair of circular Alfa Romeo stickers. Printed in Black & Rusty Orange colour on Silver background for a slight metallic look (left in the photo). Machine cut to circular shape (White background is not part of the sticker). Printed on a UV printing machine which gives high resistance to damge by solvents such as petrol etc. so can be fitted to gas tanks without required a protective clear coat. Each sticker measures approximately 100mm diameter. Autodelta Performance Parts Stickers. 4" Pair.